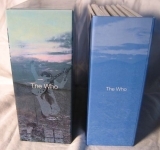 This promo box contains seven Who mini lp cds which were released on the Polydor label on 1999-09-29. This is a limited edition, out of print, drawer-style promo box. It contains seven of the mini lp cd titles which were released on the Polydor label on 1999-01-09. Images of all individual releases can be found on this site from the following links. NOTE:Promo boxes are issued without an official Release ID. For the purposes of classification within this website, we have used the code assigned by Disk Union when the box was being offered for sale. If you have specific information related to the origin of this promo box, release date and quantity produced, please let us know so we can add the information here.